Weller, Jac. 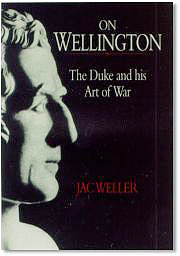 On Wellington, The Duke and his Art of War. London: Greenhill, 1998. 320 pages. ISBN 1-85367-339-0. £12.95/$18.95. Paperback. The book is a collection of papers and articles about Wellington and the wars where he played a role. It gives a very good overview of Wellington's abilities, his art of war and his personality. In the nearly 200 pages one can get a good impression why he is regarded as one of the best military leaders of his time, beside Napoleon and Suvorov. After reading this book every Napoleonic enthusiast and scholar must admit that Napoleon faced a very hard task while offering combat at Waterloo. One has the impression that Napoleon should have read this book 200 years ago. The book presents in different chapters the theatres of war where Wellington commanded, and analyses his character, how he organized his army, his tactics and battles, and the weapons used at the time. The author is very unbiased, showing both his strengths and weaknesses. The book is heavily illustrated with 16 pages of photographs and 12 high quality and detailed maps. At the end of each chapter/article there are many useful and interesting notes that provides additional background information. The author provides an extensive, annotated bibliography for each section, plus recommendations of books for further reading. This work is easy to read and because of it, it is a very valuable source for further information for those who wish to do more research on the topic. A nice touch to the book is the preface by the Duke of Wellington. Jac Weller finds a perfect way to present the "story" under many different aspects: he tells the facts, analyses the historical and military aspects, and shows his personal conclusions and point of views. The many articles on a variety of topics will hold the interest of even those people who have read many books about Wellington and his art of war. Even those who are mainly interested in Napoleon can learn many facts that will help to answer their questions about him. Enthusiasts will welcome this different perspective of the great events of the age. Thanks to Greenhill for publishing this work. Such a collection of separate articles and papers is a most interesting and entertaining publication.